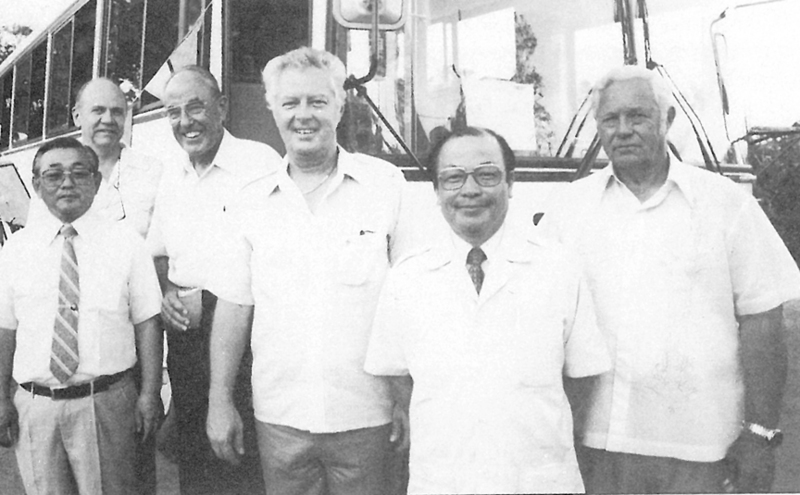 On April 18, 1984, Commonwealth Motors, a division of Jones & Guerrero Co., was selected by Hino Motors Ltd. of Japan to distribute buses and heavy equipment in Micronesia. 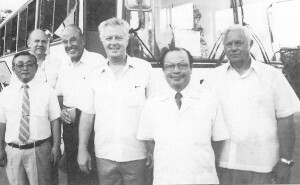 At the reception at the Guam Hilton were (from left) ShoichiNagura, managing director, Hino Auto Body Ltd.; Lee Holmes, president of Guam Cable TV; R.T. “Twick” Grant, first general manager of Triple J Motors; Robert H. Jones, executive vice president of Jones & Guerrero; Tsunenori Yamauchi, general manager of Hino Motors overseas marketing division; and Kenneth T. Jones Jr., president of Jones & Guerrero. When Robert H. “Bob” Jones first founded Triple J Enterprises Inc. with his wife, Margaret, and sister, Georgia Stafford, in September 1984, he did not know what it would become over the course of the next three decades. Now people look at Triple J and see the empire that Jones and his family have built. Operating in Guam, Saipan, Palau, Marshall Islands, California, North Carolina, Shanghai and Hakuba, Japan, Triple J Enterprises Inc. businesses include auto sales, parts and service, car rental, food wholesale and retail, real estate, property development and restaurant management. But 30 years before the Triple J Group became the business giant that it is today, Jones was just a man with a kiosk trying to sell some cars. Jones bought the company from his brother, Kenneth, the president of Jones & Guerrero at the time, whom Jones worked under for a year before starting on his own. Jones says he still remembers those slow, early days struggling to get the financing to populate the first Triple J lot with cars. “We’d go to the bank to borrow the funds, and we were getting skimpy loans in the beginning because we just didn’t have the finances to earn larger ones,” he says. Jones has fond memories of his children helping him throughout Triple J’s growth, cleaning cars and helping out in the parts and service departments before going on to earn their stripes in managerial positions.